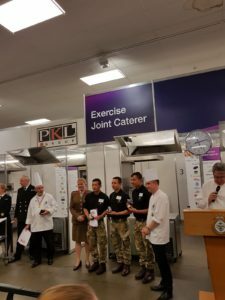 It has been a busy period for the 1 Royal Gurkha Rifles Catering department since the unit move back to the UK in late Summer 2017. 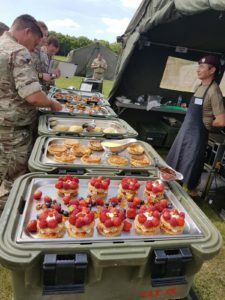 Families Day – Almost immediately that the whole of 1 Royal Gurkha Rifles (RGR) were back in the UK the battalion organised a Families Day function for all members of the battalion and family members. Of course as you would expect the Catering Department was called upon and delivered to the highest standard. Dashain – This was the first Dashain with 1 RGR for Queen’s Own Gurkha Logistic Regiment (QOGLR) members assigned to this unit. 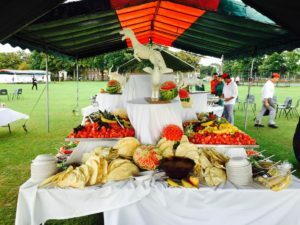 The chefs used this opportunity to showcase their professional excellence by producing mouth-watering food and spectacular decoration of Fat and Melon Carvings. Training – Our team has won the tri-services catering competition in the Open field category for the last two years, so the current chefs have the added pressure to maintain this reputation. To ensure that we create history by winning this for the third time, our training is well underway under the watchful eyes of key personalities of the new battalion. 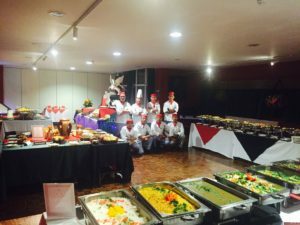 Exercise JOINT CATERER – We have done it again! 1 RGR Catering department for the third year in a row achieving GOLD medals and BEST IN CLASS. This is an unprecedented record for us. From this small department, we won 6 Gold Medals, 1 x Silver Medal and 1 x Bronze Medal. Career Professional Development – Development of soldiers is at the heart of everything we do here. 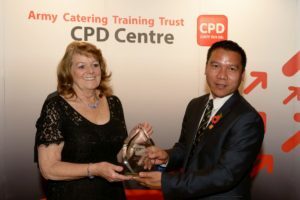 The reflection of this was shone when Catering department was recognised with the awards for Outstanding Contribution on CPD Drive and Best Achiever on Customer Service Level 3 qualification.